We’d love your help. 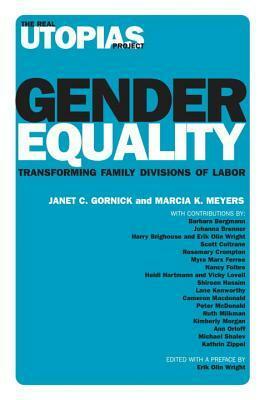 Let us know what’s wrong with this preview of Gender Equality by Janet C. Gornick. In the labor market and workplace, anti-discrimination rules, affirmative action policies, and pay equity procedures exercise a direct effect on gender relations. But what can be done to influence the ways that men and women allocate tasks and responsibilities at home? In Gender Equality, Volume VI in the Real Utopias series, social scientists Janet C. Gornick and Marcia K. In the labor market and workplace, anti-discrimination rules, affirmative action policies, and pay equity procedures exercise a direct effect on gender relations. But what can be done to influence the ways that men and women allocate tasks and responsibilities at home? To ask other readers questions about Gender Equality, please sign up. People has to write more books like this over gender equality.